Dr. Green writes that the school term began very nicely, and that he is monitoring the Possum Trot school, and making sure some of the teachers are spending as much time as they can up there. He also says efforts are being made to make sure students from all schools feel part of Berry as a whole. Martha Berry tells of some of the conditions she has seen at Possum Trot, including students that can use the bus, uniforms, and living conditions. 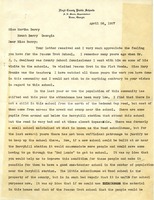 In this letter Martha Berry asks for a donation for the Possum Trot school. Zell Ryan tells Martha Berry that the Home Economics Club is sending $15 to contribute to the Possum Trot School and the welfare fund. 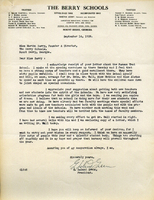 She tells Martha Berry that they have also given $15 to Miss Alston for supplies for girls who do not have funds and contributed $27.90 for magazine subscriptions for the girls school library. She thanks Martha Berry for the opportunity to be a part of the Berry Schools. 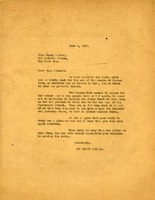 She hopes that the club will grow to be a "living expression" of their devotion to Martha Berry. Martha Berry expresses her gratitude for Mr. Holt's tremendous monetary contribution to the Possum Trot children in a time of great need. 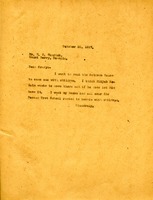 She includes the thanks of the children and a description of their Christmas celebration. 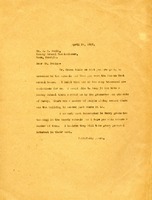 The Berry Schools write to Miss Walker thanking her for the radio that they received. They say that since the Possum Trot school is closed, the radio would be a better fit with the boys at the Foundation School and that they will install it where best on the campus. 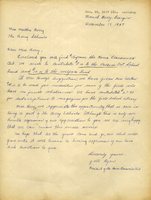 Letter from Martha Berry to Mr. A. H. Swain regarding the Possum Trot School house. 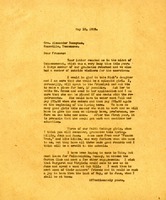 In this letter to the County School Commissioner, A. H. Swain, Martha discusses her wish to keep the Possum Trot School. She then discusses how she likes working with the graduates from Berry that also work in the county schools. Swain, the Superintendent of the Floyd County Public Schools, writes to inquire about a potential collaboration with the Berry Schools. 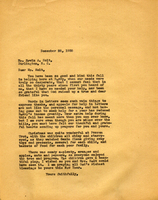 In this letter Martha Berry is telling Mr. Hamrick that she wants the houses near the Possum Trot School to be rented to people with children.